One of the main challenges of Project QUILTING is that you only have one week to accomplish the project. It doesn’t take much to happen for a person to miss the deadline. This week we had a new participant have some technical difficulties and her piece did not make it in on time. I’m very happy that she sent me pictures of her piece anyway so I can still share it with you all. I know I am too late for the contest but since I went to the trouble of rushing to finish this flying geese project I thought I would submit it anyway. yesterday. I went through my stash and wasn't sure that the colors would work, but after getting it together I think they work better than I thought. 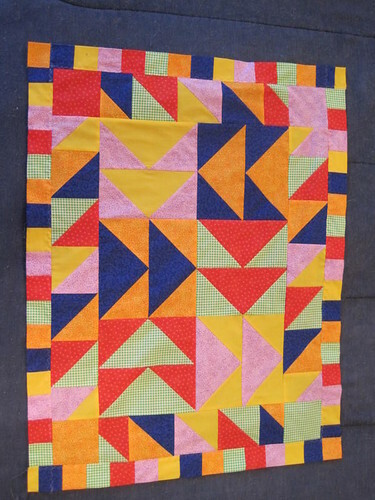 I made the flying geese first, then I sewed the leftover triangles for the outer border. For the binding I used the same colors but used 4x2 inch strips folded in half. I like how it came out. I haven't decided if I want to add a sleeve on the back for a wall hanging or if I will send it to my granddaughter for a doll blanket. If you ever get sick, have technical difficulties, or even don’t have time to do a challenge until WEEKS later don’t be shy about posting your piece and sharing it with everyone. If you do this I’ll be happy to blog about it and the story behind it. I realize that the time frames don’t always work for everyone BUT I do still feel that these challenges can really inspire people to create amazing pieces and I hope many take advantage of it. There’s still plenty of time to VOTE for your favorite Project QUILTING Flying Geese entry for the previous challenge so check out this post: http://kimscraftyapple.blogspot.com/2011/03/time-to-vote-project-quilting-flying.html to see what everyone came up with!